Ever since we discovered the Ling and Ting series earlier this year, I've wanted to read something else by Grace Lin. I figured anyone who was able to write for early readers with that much wit, humor, and style would not be half bad for a slightly older crowd. 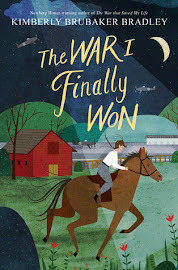 And then, when I was reporting on my reading goals for the first half of this year, I mentioned that I still needed to read a past Newbery honor book to fulfill one of the goals. Beth suggested this one, and that was all the additional encouragement I needed. Minli lives on Fruitless Mountain with her Ba and Ma. The name suits the place, and they have to work hard just to eke out a meager living. In the evenings, Ba tells Minli stories--a pastime that Ma does not approve of ("Our house is bare and our rice hardly fills our bowls, but we have plenty of stories. What a poor fortune we have"). One of those stories is about the Old Man of the Moon, who reads the Book of Fortune and directs the destinies of people on earth. When Minli hears it, she decides to travel to Never-Ending Mountain and ask the Old Man how to bring fortune to her house. Of course, once Ba and Ma discover Minli is gone, they are devastated. As Minli journeys and Ba and Ma hope for her return, they all realize the fortune they had might not have been so bad after all. I started out liking this book but not loving it. I felt like I could see the end from the beginning: Minli would go on this long journey and never find the Old Man of the Moon, but she would meet people along the way who would help her realize that the love of her Ba and Ma was all the fortune she needed. Her fortune wouldn't change, but her heart and expectations would. I was right in part: at its heart, this is a story about family and relationships and how those are the most valuable possessions. 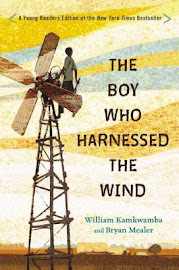 But it was the parts I was wrong about that made me switch from a mere liking of this book to a strong loving of it. I can't share the resolutions of those false predictions without giving away the best parts of this book, but if you read it, just put aside all preconceived notions and let the story beautifully unfold. Grace Lin is a storyteller, and she has that rare talent of being able to tell a story within a story within a story: part of the plot depends on the folktales of Minli's father and others; part of it is made up of Minli's own journey; and eventually, Minli's story joins the others as being one that is passed down from generation to generation. 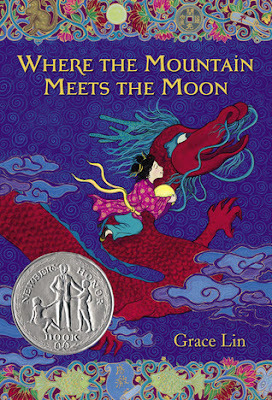 The folktales not only relate to Minli's own journey but also to one another: the same characters and objects appear again and again (i.e., the magistrate, the moon, the red thread, etc. ), and even little details (like peaches) keep the stories connected. Minli gets her instructions for how to get to Never-Ending Mountain from a goldfish. (Minli bought the goldfish in a rare frivolous moment but then decided her family really didn't have enough money to be able to feed themselves and a pet.) The story cuts to the next scene before the reader finds out what those instructions are, and so each new step in Minli's journey is a surprise. There were two really poignant moments in the story for me. One occurred after Ba and Ma return home after trying to find Minli (the narrative skips back and forth between Minli and her parents). Ma catches Ba with his ear in the goldfish bowl (long story, but as they were searching for Minli, they ran into the goldfish man, and he gave them another goldfish). Ma doesn't know that Ba can hear the goldfish talking to him and so has no idea why he would be doing something so ridiculous as sticking his ear into the bowl. Ba feels embarrassed, and both of them start laughing. "Their laughter intertwined but when they looked at each other, they could see the tears forming were not from joy." I felt like real grief was captured in that moment: the situation was funny, but as they laughed about it, that emotion released another and gave them permission to cry. The other moment occurred when Minli is at the base of Never-Ending Mountain. She is saying good-bye to the villagers who live there. They are a perpetually happy people, and before she leaves, they give her a brightly colored coat that they made overnight. As they raise their arms to wave good-bye, she realizes that each one is missing a square of cloth from his or her own sleeves, and she realizes that each one gave a piece to make her own coat. She is touched by the generosity and kindness, and I was too. Speaking of the villagers, Minli's story is supported by a wonderful cast of secondary characters: Ba and Ma, the goldfish man, the goldfish(es), the dragon, the buffalo boy and his friend, the king, A-Fu and Da-Fu, and, of course, the Old Man of the Moon. Each one was important and memorable, and as the narrative shifted and focused on each of their stories in turn, I began to see how they were all connected and how Minli's story was just one that fit into this seamless history--hence, the story within the story within the story. 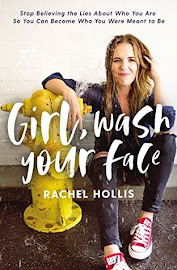 I read (actually, listened) to this by myself (and, although I liked the audio, the actual book is worth checking out because it is filled with Grace Lin's beautiful illustrations), but I think it's one my kids would have enjoyed listening to also. I'm kind of sad I didn't take them on the journey with me, but not really because now I can read it again. This is truly one of my favorite books of all time. I heard Grace Lin speak and she is a lovely person. I hope you get a chance to read the companion book, too. Starry River of the Sky. Yes, it's on my list! I read it out loud to my youngest, and he would then read ahead a bit. It's a good book for growing reading muscles because the stories-in-a-story are kind of a resting spot. But I'd have to keep sneaking into his room during the day to read the parts he had read to himself. It's such a relief that you liked it. You know the feeling when you recommend a book that you liked and then you wonder if the recomendee will hate it and think you are an idiot? Or maybe that's just me... But I'm always happy when the book works! That's a great way to describe the folk tales, as a "resting spot." I think the fact that he kept reading ahead is a testament to what a great book it is. Oh yes, I know the feeling. But no worries in that regard for this book! I loved it!